Chris Hedges didn’t grow up on a farm. He didn’t even grow up thinking he’d like to be a farmer. But that all changed when his parents realized their own dream of farm ownership and bought a farm property. Chris, who had completed university and was working as a lender at a credit union by then, became interested in the 20 acres of orchard on the farm in Norfolk County and decided he wanted to give it a try. Today, Chris farms with his wife and has 120 acres of apple orchard in varying stages of commercial production. He also runs Ontario Orchard Supply, a business he started in 2004 that sells orchard supplies to apple growers, and works for Martin’s Apples in the Waterloo area as a manager of grower relations. Hedges’ main varieties are Honey Crisp and Gala, which make up 60 per cent of his production, and he also grows Red Delicious, Empire, McIntosh, Ambrosia and Zestar. 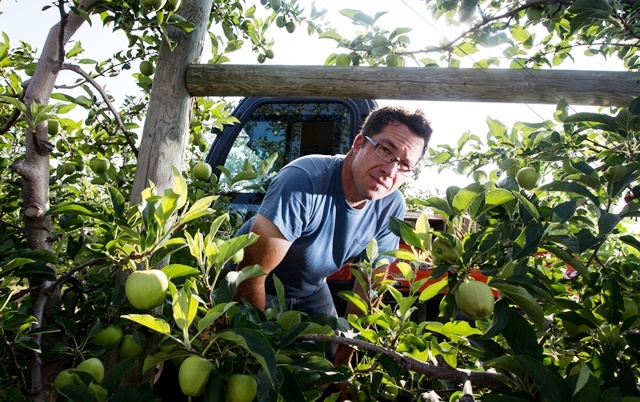 He was the first apple farmer in Canada to plant Crimson Crisp, a disease-resistant up-and-coming variety – of no relation to the highly sought after Honey Crisp – that is starting to grow in popularity. “We’ve settled on tall spindle type spacing in the 3’ x 12’ range, where we feel we are maximizing the number of trees we plant,” he explains, adding that as a board member of the International Tree Fruit Association he’s had the opportunity to travel a fair bit and see high density orchards working in other regions. The main advantage of the high density system is that the trees are smaller so the fruit is exposed to a lot of sunlight, resulting in a very high quality, consistent apple. Hedges says over 90 per cent of his fruit from this system are given a Canada Fancy or higher grade, which means he receives a better price for them. The smaller trees also make it easier to harvest the apples, saving on labour costs. Another innovation in Hedges’ orchard is the frost fans he added following a frost in 2010 that did a fair bit of damage to his newer varieties. Once temperatures fall below a certain point, the computerized fans automatically start up, keeping the air in the orchard circulating and preventing frost. Frost damage affects apple quality, resulting in smaller, unshapely and discolored apples or in no apples at all if frost hits at blossom time. For Hedges, the fans came in handy during the early spring frosts of 2012 which devastated large segments of the Ontario apple industry. Photo courtesy of The Grower.